Baltimore is the largest city in Maryland. 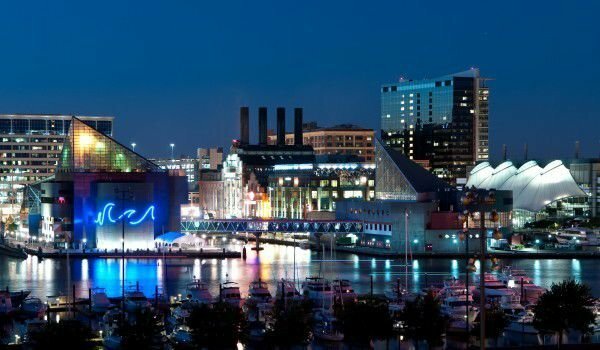 Several things characterize Baltimore - a beautiful port, unique museums, rich history and the colourful diversity of people and cultures. The city is located in the sleeve of Chesapeake Bay. Baltimore harbour is considered one of the most important in the U.S. It was the first thing that hundreds of thousands of immigrants were seeing, when arriving in the New World - America. Baltimore is often called the "charming town." Among the most visited places is the Inland port, where residents and guests can enjoy the rich diversity of restaurants, bars, shops and office buildings. There is the famous Baltimore Aquarium, where you can see over 660 species of marine creatures. The aquarium is considered one of the best in the United States and worldwide. It is the biggest tourist attraction in Maryland. In 2006 the aquarium was named best family destination. Access ticket costs $ 19.95 for children and $ 25 for adults. Another point of interest is the Maryland research centre. The place attracts with its modern planetarium, 3D projection rooms, exposed remains of dinosaurs, and many others. Tickets are available for between 10 and 20 dollars. Among the biggest attractions of the city is the Baltimore World Trade Center. The 124 meter high building is considered the highest pentagonal building in the world, entirely consisting of symmetrical walls. On the top 27 floors of the mall, visitors can see "the palm", a large part of Baltimore, the Internal port, Federal Hill Park, and of course- the main port. Emblem of the city is the elegant Washington Monument, built in honour of George Washington in 1829, in the base of the obelisk is a museum telling the history of the American military and political leader. To reach the top of the monument, you must climb 228 steps. From the highest point is a beautiful view of Baltimore. The monument was designed by the Robert Mills project - architects, who realized the magnificent Washington Monument in the U.S. capital Washington. Interesting to tourists are the submarine USS Torsk, USS Constellation, the sailboats, and of course the baseball stadium Oriole Park. In Baltimore, you can visit the grave and the house-museum of the famous writer and poet Edgar Allan Poe. It is located on 203 Amity Street. The two-storey house consists of 5 rooms, in which lived and worked the American writer. Among the landmarks of the city is the Baltimore Basilica. This religious temple is considered the first Roman Catholic cathedral built in the U.S. The majestic building was raised in neoclassical style. The Baltimore Basilica is the oldest Catholic cathedral in the United States. Baltimore is home of the beautiful Presbyterian Church. The building was built in 1870, in the Gothic style. The building is considered one of the most significant buildings in the city, a real treasure of art and architecture. An interesting building, although not among the most popular is the Phoenix Shot Tower. The red brick building is higher than 70 meters. Shortly after its construction, in 1828, the tower was the highest in the U.S.
Baltimore is home of the beautiful Emerson Bromo-Seltzer Tower. On each of the four walls of the magnificent building is a huge clock. The tower was built in 1911 and is 289 meters high. The Walters Art Museum is another interesting place to visit, which is recognized internationally, because of the unique exposures that it contains. The city is named after Lord Baltimore - the first private Governor of the Maryland Province and was founded in the 17th century. By 1870, it was the second largest city after New York. Baltimore played a key role in events leading to the American Revolution.